Welcome to the companion web site for Jason Livingston's Designing With Light: The Art, Science, and Practice of Architectural Lighting Design. Instructors, request an evaluation copy here. Designing With Light is available as a soft back book and as an ebook for Kindle, Nook, iBooks, and the Google Play Books app. You are browsing the Blog for Color. In this series of posts about IES TM-30-15 I’ve discussed the problems with CRI and the resistance to adopting TM-30. In this post I’ll discuss the advantages of TM-30 over CRI, and what TM-30 is and isn’t. Like CRI, TM-30 compares color samples rendered by a given test light source and a reference illuminant of the same correlated color temperature (CCT). The first advantage of TM-30 is the selection of color samples. CRI uses the eight samples show in Fig. 1, which are selected from the Munsell color system. All eight are of medium value and are not evenly distributed across the color space or across the visible spectrum. This allows lamp manufacturers to “optimize” lamp spectra to score a higher CRI Ra than visual evaluation of the light would indicate. TM-30 uses the set of 99 color samples shown in Fig. 2. These color samples range from pale tints to saturated colors, and are drawn from real world objects including textiles, plastics, skin tones, printed materials, natural objects, and paints. These colors have been selected from a database of about 105,000 objects. 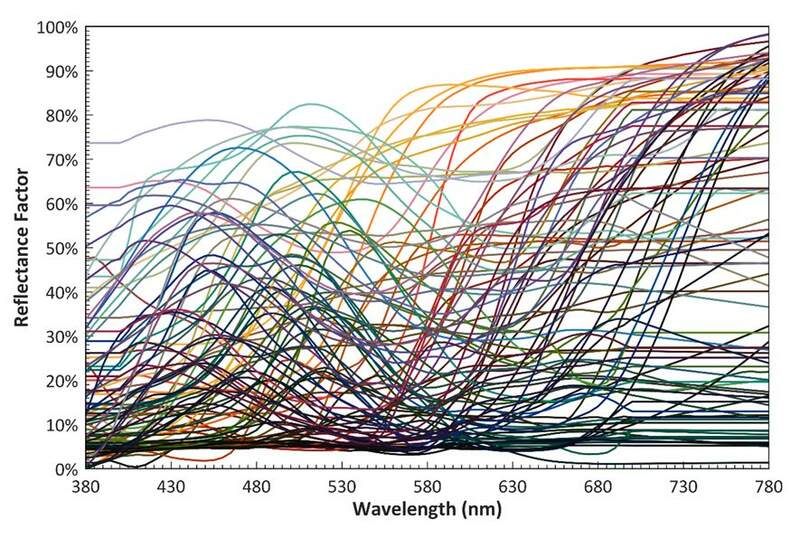 In reducing that number to one that is more manageable, the authors of TM-30 made sure that the color samples were even distributed across the most modern color space (CAM02-UCS) and that their reflectances were evenly distributed across the visible spectrum, as shown in Fig. 3. Spectral tuning (gaming the system to achieve a higher score) isn’t possible with these color samples, which means that the resulting scores are honest, and comparisons of light sources are apples-to-apples. The second advantage of TM-30 is the selection of color space. A color space is a model of a range of possible colors. In our case we are interested in a color space that encompasses the entire range of visible colors. CRI uses a color space called CIE 1964 (U*, V*, W*), which is no longer recommended for any other use. In other words, it’s very outdated. TM-30, on the the other hand, uses the most up-to-date color space CAM02-UCS. TM-30 isn’t locked in time, either. There is a new, more accurate color space under discussion at CIE. If it is approved, and increases the accuracy of TM-30, I expect it would be included in a future update. Like CRI, TM-30 uses Plankian radiation (blackbody radiator) for lower CCTs and the CIE Daylight (D) Series for higher CCTs for the reference light source. The difference is that CRI Ra has a pronounced shift at 5000 K from one to the other, resulting in the possibility of a significant shift in Ra values between 4999 K and 5001 K. TM-30 overcomes this by using a proportional blend of Plankian radiation and the CIE Daylight (D) Series between 4000 and 4999 K, much the way a variable white LED fixture blends LEDs of two different colors to achieve its full range. Instead of a single fidelity value, as with CRI Ra, TM-30 give us a wealth of data about the color rendering of the light source in question. The first is the Fidelity Index Rf. Like Ra, it is a comparison of the color rendering of the test light source compared to the reference light source. However, with 99 color samples it is a tougher test that cannot be gamed. I’ll have more to say about Rf in a future post. The second is the Gamut Index Rg. Rg indicates the average change in saturation of the 99 color samples as rendered by the test source compared to the reference source. I’ll have more to say about Rg in the future, too. So, from the start TM-30 gives us more information, but it doesn’t stop there. It also divides the color space into 16 wedges, called hue angle bins, as shown in Fig. 4. The Rf and Rg values of each bin are also calculated and reported so that if a specifier is interested in the performance of a light source in a particular color range, that information is available. The information is also presented graphically by showing the average shift of each bin on the same graphic. In addition, if you really want to dig down deep, the TM-30 calculation tool calculates the Rf and Rg values of the individual 99 color samples. TM-30 is a calculation procedure that takes an objective and statistical approach to analyzing two aspects of color rendering – fidelity to a reference source, and saturation shift relative to the same reference source. The calculation also produces information about hue shift, which is presented graphically. The calculation procedure is a consolidation of years of research by individuals and organizations around the world. Its authors come from the research, specification,and manufacturing areas of the lighting industry. Research since its introduction in 2015 has supported its validity as an accurate method of characterizing color rendering. The CIE has endorsed Rf for scientific use in CIE 224:2017 Color Fidelity Index for accurate scientific use. Unfortunately, they declined to endorse it for specification or other uses, as I’ve discussed here. However, quite a few manufacturers see the advantage of TM-30 and are including Rf and Rg information on their cut sheets. TM-30 isn’t a color rendering guide. It doesn’t contain recommendations for acceptable values. It reports calculated values and leaves interpretation of those values to the specifier based on experience and the particulars of the project. (However, the IES is likely to publish guidance in the future.) It also doesn’t attempt to evaluate color perception or color preference. Those two aspects of color are application (and even situation) dependent, so again the specifier will use experience and understanding of the project to determine what values are appropriate and/or acceptable. TM-30 provides significantly more information about the color rendering of a light source, and the information presented is far more accurate than CRI. The authors of TM-30, and the IES Color Committee in general, are open to improvements in the calculation and the presentation of its results. As additional scientific information becomes available, or improved or expanded means of calculation and presenting information are developed, it can be updated as needed or on a regular three to five-year cycle. The introduction and transition to electronic ballasts and transformers meant that we had to learn about reverse phase dimming and control protocols. The T5 lamp meant we had to change our layout patterns to accommodate lamps that weren’t standard 2’, 4’, and 8’ lengths. Metal Halide lamps, especially PARS, meant that in exchange for energy savings we had to learn about the color rendering of a new type of lamp, and give up dimming. Daylight harvesting and daylight responsive designs meant we had to learn about daylight zones, photosensors, and daylight harvesting control systems. White LEDs meant we had to learn about another light source and its specific pros and cons, including different color rendering properties due to its SPD. Circadian lighting means we are all in the process of learning how and when to apply the most current scientific evidence to certain project types. Since the science is constantly advancing on this topic, we must be aware and continue to educate ourselves. Regularly updated energy conservation codes mean that as we begin to memorize the lower LPDs and changes to control and daylighting requirements, we have to relearn that information because it changes every three years. Most recently, we’re supposed to enthusiastically embrace IoT, adding huge complexity to our lighting control systems and opening them up to hacking. But, I keep hearing that industry adoption of TM-30, allowing specifiers to have a much clearer idea of the color rendering properties of their light sources, is tooo haaaaard! This is especially maddening when so many professions, including lighting design if you have an LC or LEED credential, require continuing education that is supposed to be more than halfway paying attention to a webinar. Manufacturers love introducing and promoting new products and technologies that will expand profits, and specifiers get the hard sell all the time. But some manufacturers don’t want to consider TM-30 for several reasons. First, there’s the fear that the Rf value, which is analogous to CRI Ra, will be lower than the Ra value. Even though it’s a different, and tougher, test they fear loss of sales if numbers change. I suspect the manufacturers who fear this the most are those who have most engineered their spectra to score well on Ra, but know that Rf can’t be gamed in the same way. Second, as one manufacturer flat out told me, they’d rather put their money into IoT (and other new and profitable products) instead of updating cut sheets and web pages. Here’s the thing – as a designer and specifier I have no interest in being stuck in 1965 (the year CRI was unveiled) or even 1995 (the most recent update to CRI). We know that CRI is flawed, we know what the flaws are, and we know that the CIE has been unable to come to consensus on fixing the flaws. The IES has done a great job of developing a new, accurate, modern tool that gives us so much more information than CRI ever could. My design decisions, and my ability to learn about my profession so I can be better at it, are not driven by manufacturer profit masquerading as manufacturers worrying about specifier or consumer confusion. Research over the past two years has shown TM-30 to be more accurate, and we continue to learn more about how to effectively use it. Lighting specifiers should begin the transition to TM-30 by insisting that manufacturers provide them with Rf, Rg, and color vector graphics. Comments Off on Who’s Afraid of TM-30? It’s been a little over two years since the IES released TM-30-15 IES Method for Evaluating Light Source Color Rendition. In that time TM-30 has seen growing support in the industry and a growing body of evidence for its accuracy and usefulness. We’ve nearly reached the moment when we can all agree that it’s time to retire CRI and fully adopt a modern, accurate system of measuring and describing the color rendering of light sources. What’s wrong with CRI? Quite a bit, so if you’re not up to date on the issue here’s an overview. In 1948 The CIE first recommended a color rendering index based on a method developed in 1937. The 1937 method is a fidelity metric (that is, it compares a test light source to a reference light source) that divides the spectrum into eight bands and compares each band to a full spectrum radiator. In 1965 the CIE finally adopted CIE 13-1965 Recommended method of measuring and specifying color rendering properties of light sources, based on a test color sample method, what today we call CRI Ra or just CRI. From the start it was apparent that there were problems. In 1967 a committee was established to correct for adaptive color shift. Other problems were uncovered, and in 1974 a formal update was published. Errors were uncovered in the 1974 edition, resulting in a third version in 1994, which is the version we use today. Averaging the color shifts of the eight test colors says nothing about the rendering of any single sample. A large error in one color can be masked by accurate rendering of the other samples. The test color samples are all of moderate saturation so the index doesn’t reveal color shifts in saturated colors. In addition, the test colors are not evenly distributed through the color space or the spectrum, so light source spectra can be engineered to score higher than visual observation would indicate. The color space used, the 1964 UCS chromaticity diagram, is no longer recommended for any other use. All chroma shifts are penalized, even though research shows that moderately increasing chroma is desirable in many applications. The chromatic adaptation used has been shown to perform poorly and is no longer recommended for any other use. A single number index gives no information about the direction or extent of color shift for any particular color or color range. Why haven’t these problems been corrected in the past 23 years? I’m told that there are two issues. The small issue is that competing scientific interests on the committee advocate new metrics that they’ve developed as a replacement or supplement to CRI. The larger problem is that manufacturers on the committee don’t want to see any changes that would reduce the CRI of any of their lamps. From their perspective, it’s better to have a high score on an inaccurate test than a low score on an accurate one. It seems that internal politics has been preventing updates, corrections, and improvements. Although many other color rendering metrics have been proposed over the years, none has been adopted by CIE, which has the most significant voice on this issue. The result is that the sole internationally accepted metric, which has also been written into product specifications and into codes, is CRI. That began to change in 2015 with the introduction of TM-30. I’ll have more to say about TM-30 in future posts, but for now let’s agree that CRI Ra is broken and CIE is in no hurry to fix it. A better system exists, and our industry should adopt it. The World Has Millions of Colors. Why Do We Only Name a Few? This article explains an interesting new theory on why we have names for some colors, and why colors are named in the same order for almost all languages. Comments Off on The World Has Millions of Colors. Why Do We Only Name a Few? 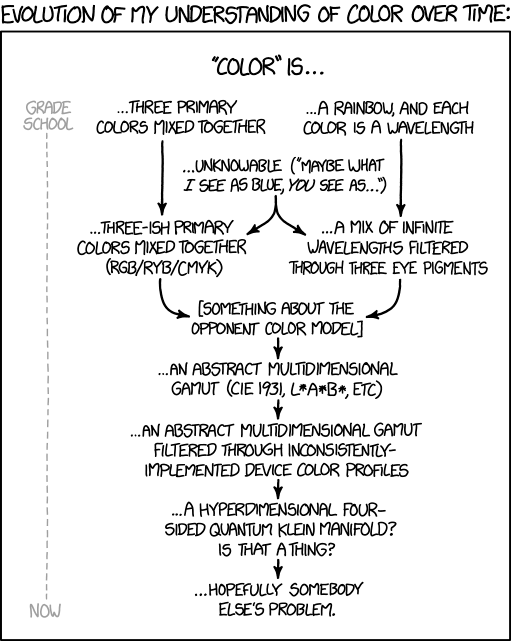 A little color fun from xkcd.com. Last year the AMA issued Policy H-135.927 Human and Environmental Effects of Light Emitting Diode (LED) Community Lighting, which recommended, among other things, that LED outdoor lighting should have a CCT of 3000 K or below. The AMA made this recommendation thinking that lower correlated color temperatures contain less blue light, which can disrupt circadian rhythms. is inadequate for the purpose of evaluating possible health outcomes; and that the recommendations target only one component of light exposure (spectral composition) of what are well known and established multi-variable inputs to light dosing that affect sleep disruption, including the quantity of light at the retina of the eye and the duration of exposure to that light. A more widely accepted input to the circadian system associated with higher risk for sleep disruption and associated health concerns is increased melanopic content, which is significantly different than CCT. LED light sources can vary widely in their melanopic content for any given CCT; 3000 K LED light sources could have higher relative melanopic content than 2800 K incandescent lighting or 4000 K LED light sources, for example. Follow the link to read the entire Position Statement. Blue light hazard, light’s impact on circadian rhythms and overall health, and related topics are a hot area of research. We’re learning more all the time, but we don’t yet know enough to apply circadian lighting to every situation. Outdoor and street lighting are among the areas where research is not yet conclusive. Like other lighting technologies, the color or chromaticity of light emitted by an LED can shift over time. To address the challenge of developing accurate lifetime claims, DOE, together with the Next Generation Lighting Industry Alliance, formed an industry working group, the LED Systems Reliability Consortium (LSRC). 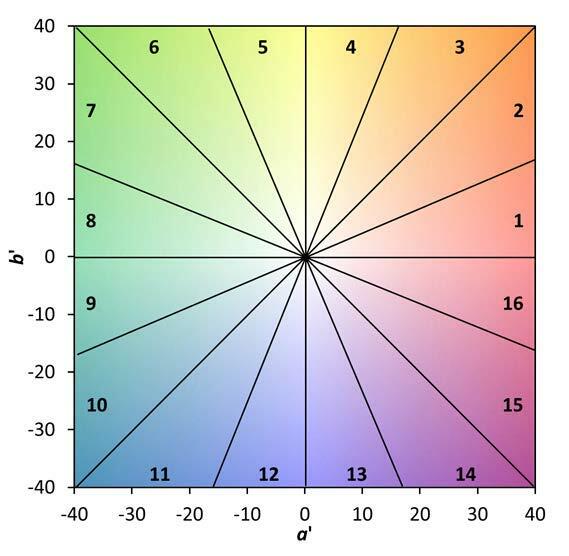 A new LSRC report, LED Luminaire Reliability: Impact of Color Shift, focuses on chromaticity. The purpose of the new report is not to define limits for specific applications, but rather to enable a better understanding of how and why color shifts, and how that impacts reliability. Download it and take a look. The CIE has issued a statement titled “CIE 2017 Colour Fidelity Index for accurate scientific use” in which they partially adopt the Rf fidelity metric of TM-30. Here are some of the details. When the IES released TM-30-15 it seemed to be a wake up call for the CIE, who have understood the inaccuracies of CRI but haven’t been able to build the internal consensus to correct them. Two CIE committees soon began work, one on the issue of fidelity and one on other perception related issues. The committee that worked on fidelity (TC 1-90) has decided to adopt TM-30 Rf with a few minor changes to the calculation. They are calling this the CIE 2017 Color Fidelity Index, which will still be described as Rf, and are asking the IES to adopt the same changes to the calculation so that both Rfs are the same. I’ll probably have more to say once I read the entire report. If you want to read the report yourself you can purchase it here. As the co-chair of the IES Color Committee I am delighted (pun intended) to announce the publication of the Design Guide for Color and Illumination. The guide is the result of over five years of work by more than a dozen researchers, engineers, manufacturers, and designers from across the globe. Here’s part of the description on the IES site. Color can be described using concrete values such as chromaticity coordinates, spectral power distribution, or others discussed later in this guide. However, one’s response to color can be much more personal and emotional—and therefore more difficult to quantify. This guide takes the reader from basic vision and color vocabulary, through methods of measuring and quantifying color, and culminates in the practical use of commercially available white light and colored lights. The definitions, metrics, and references discussed will assist in building a critical understanding of the use and application of color in lighting. It is probably the best, most thorough discussion of light and color available today. Everyone interested in color, color perception, color rendering, and their relationship to light should read it. It will be available at the IES booth at Lightfair. You may remember that in June of last year the American Medical Association (AMA) released a report called “Human and Environmental Effects of Light Emitting Diode (LED) Community Lighting.” The report made some noise in the general press because it supported the idea that blue light from blue-pump white LEDs contribute to disability glare and retinal damage. In the lighting community there was a considerable amount of frustration and anger over the report for several reasons. First, there were quite a few references cited that were either hearsay, such as a New York Times article about Brooklyn residents who didn’t like their new LED street lights, or were irrelevant, such as several articles about the effect of skyglow on nesting turtles. The other reason was that there was not a single lighting designer or researcher on the panel. Overall, it was a poorly researched paper that didn’t deserve the attention it received. Shortly after it was issued, the Lighting Research Center at RPI issued a response paper. On March 15 the authors of that paper held a webinar to further address the AMA report. A video of that webinar is now available. If you’ve got an hour, take a look. The criteria of blue light hazard for retinal damage is much more than just color temperature, and includes the source size, intensity per unit area on the retina, and SPD of the light source. Disability glare is not a function of light source SPD, as the AMA paper suggests, although discomfort glare is. Short wavelengths increase discomfort glare. Color temperature is the wrong measurement to determine whether or not a light source will affect the circadian system and melatonin production because color temperature does not provide complete SPD information. For example, some 3,000 K LEDs can have a greater impact than 4,000 K LEDs. The criteria of blue light hazard for circadian disruption from a light source include – the intensity, duration of exposure, timing of exposure, and SPD. Jason Livingston IES, LC, LEED Green Associate is the principal of Studio T+L. In addition to his extensive design career, he has taught theatrical and architectural lighting design in New York City since 1993. He currently teaches architectural lighting design at Parsons The New School For Design and Pratt Institute. Subscribe to Designing Light and receive notifications of new posts by email. Designing Light is proudly powered by WordPress. Theme developed by Themekraft.